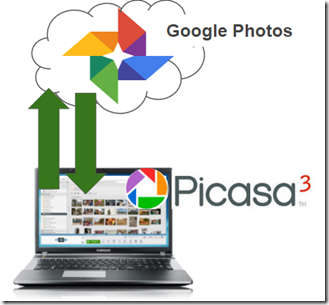 Picasa – Learn Picasa and Google Photos! 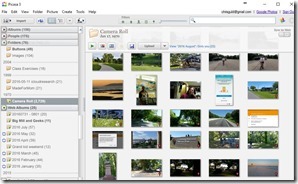 How Does Picasa Find Your Pictures? I know that Picasa has been retired by Google, but it is still available, and it still is the best free software for managing pictures on your computer. If you’re going to use it, you need to understand that the pictures must come from your computer. 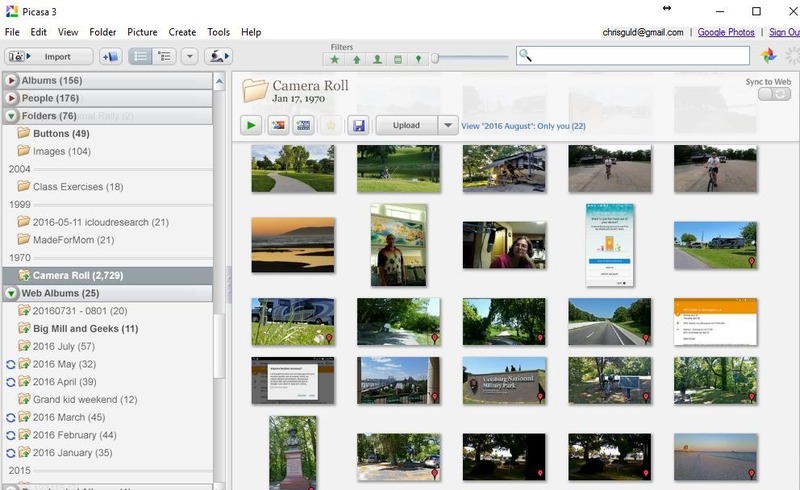 Picasa works with the pictures that are stored on your computer’s hard drives. Your first Stop in Picasa should be Folder Manager! It is a common misconception that once you install Picasa, your pictures are ‘IN’ Picasa. But that is not true. Picasa is not a container. It is simply a tool for working with the pictures that are on your computer. If you use Picasa to delete a photo, you will be deleting that photo from your computer. If you remove Picasa from your computer, your pictures are still there. You can tell Picasa which folders of pictures you want it to display by using Tools->Folder Manager. It starts out scanning your whole computer for pictures, but you should go into Folder Manager and remove the folders you don’t want to see in Picasa. Here is a video that shows you how to use Folder Manager. Understand Files and Folders! Many years ago our computer training company helped people computerize their accounting systems. The first thing we had to do was review their manual accounting system. If their manual system was a mess, computerizing it would just be a bigger mess and getting messier faster! The same principle applies with your organization of pictures. If you don’t understand the folders on your computer where your pictures are located, you really won’t understand where they are once you start using Picasa! If you use a Windows-based computer, that means learning to use Windows Explorer. If you use a Macintosh, that means learning to use the Finder. Your pictures are most likely stored in the My Pictures folder on your computer – with or without Picasa! 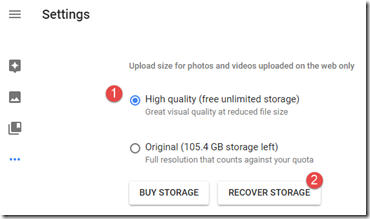 Google Photos–Is it Really Unlimited and Free? Google Photos will store your entire library, many thousands of photos, for free! YES!! 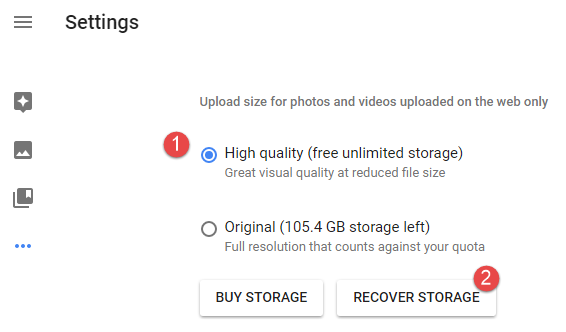 If you choose the photo size called High Quality and not Original, Google Photos will store your entire photo library of many thousands of photos, for free. 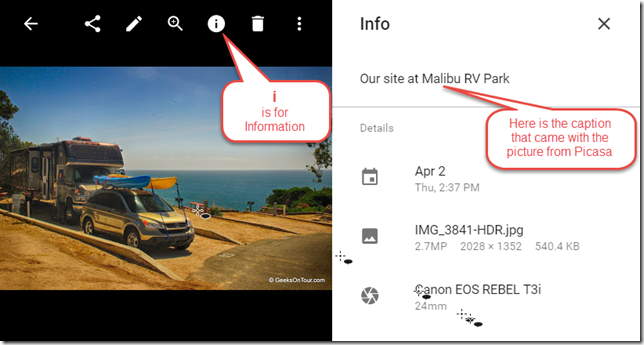 Learn more from the Google Photos Help page. At the High Quality size, Google maintains your photos’ pixels up to 16 MegaPixels. That’s 4,000 X 4,000. That’s more than most digital cameras offer today. It’s big. So it sounds like it only reduces your photo if it’s more than 16 megapixels right? Well, not exactly. It does take your photo and compresses the file size while maintaining the same number of pixels. Your 12 megapixel photo will still be 12 megapixels, but where the .jpg file for the original photo may have been 3 MB (megabytes), the file that is uploaded is compressed to about half that. If you take pictures for personal use, just select High Quality and don’t even think about it. It is truly high quality. That’s is big enough to completely fill your computer screen and be very sharp. I have printed 8X10 glossies of a picture using the original .jpg file and using the compressed ‘High Quality” file and I could not tell the difference. If you are a professional photographer who may want your picture to grace the cover of a magazine, that’s another story. I’m sure you want your original. So keep the original somewhere, but you may still want to use Google Photos at the High Quality setting. 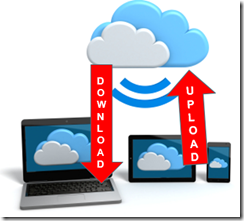 The smaller files give you a faster experience when viewing, searching, uploading, downloading,and sharing than the full size. If I have Unlimited storage, why does it say I have 13 Gigabytes remaining? Google gives everyone 15 Gigabytes of storage for free. This storage is shared by all your Google services; Gmail, Google Drive, Contacts, Photos, etc. So, Gmail and Drive may be taking up 2 Gigabytes, for example, bringing your quota down to 13. Photos uploaded using Google Photos at High Quality do not count. So, if you uploaded even 20 Gigabytes of photos, you would still have 13 GB of your quota left. If you upload photos using Google Drive, they will count against your quota. It’s only when you upload using the Google Photos Backup and Sync, with setting at High Quality, that they don’t count. What about Pictures I already uploaded at Original Size? Google now gives you a way to retroactively set past uploads to the High Quality and thus recover the storage space used up on your quota. Using a computer, go to Photos.Google.com, click on the 3 line menu and then Settings. You’ll see an option to Recover Storage. Click that and any already uploaded pictures will be compressed. Does Uploading Pictures with Picasa use the High Quality Setting? Here’s what you do: Use Picasa to upload photos at the Original Size option. 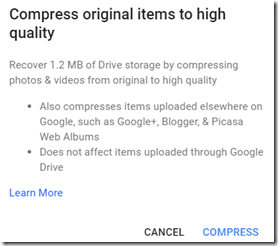 This will count against your storage quota from Google, but you can later use the option to Recover Storage and retroactively compress those files. Using Picasa on my computer, I edit photos by cropping, straightening, color correcting, etc. When I look at the pictures in Picasa I see the edited version, but when I use Facebook and Add Photo from my computer, I get the unedited orginal. Can you explain this to me? How do I get the edited version to Facebook? Short Answer: If you use Picasa’s File Save command before using Facebook’s Add Photo, you will get the edited photo posted to Facebook. 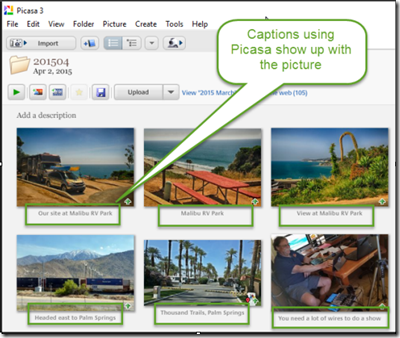 Picasa remembers all the edits you made without touching the original photo file on disk. 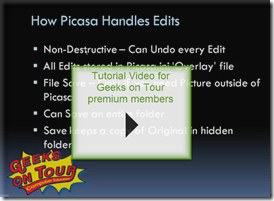 It stores that edit information in an overlay file called picasa.ini. When you view the picture using Picasa, it merges the original picture file on disk with the remembered edits from the picasa.ini file. What you see is what you get. 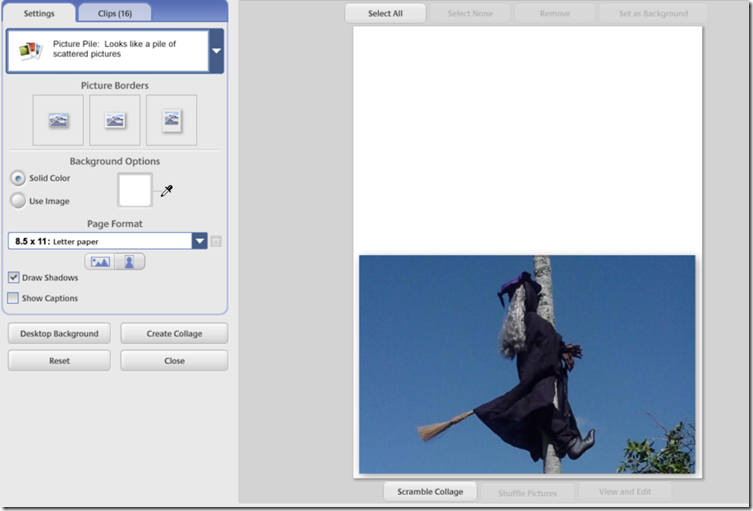 If you print, email, export, or upload using commands within Picasa, you will get the edited version. But, the picture on disk, in My Pictures, is the original photo – unchanged. If you use any other program (e.g. Facebook) to view the photo on disk, you will see the original unchanged picture. So, before using it in any other program you do need to save. 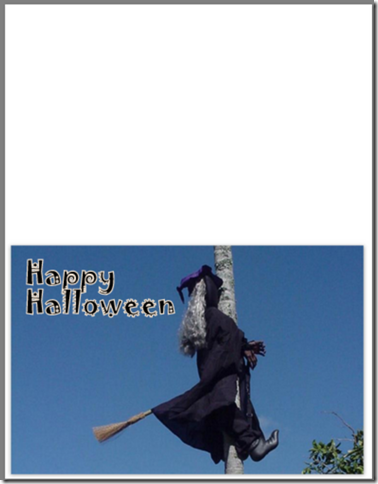 In single photo view, click File | Save. You can also click the ‘Save to Disk’ button (in Library view) to save all edited photos in an entire folder. Why Doesn’t Picasa Automatically Save Edits to Disk? To save disk space. Because PIcasa wants you to be able to return to your original at any time. When edits are saved to disk, it makes a backup copy of your originals in a hidden folder called .picasaoriginals. So, saving edits will result in twice the disk storage space being used. To keep image quality high. Each time you make a change and save those changes, you degrade the image quality a tiny bit. Think of making a copy, then making a copy of that copy, then making a copy of that copy. So Picasa’s technique is to always start with the original photo on disk, then apply any edits you’ve made when you print, email, export, or upload. This way, you are never more than one generation away from the original, and therefore the original quality, of the picture. 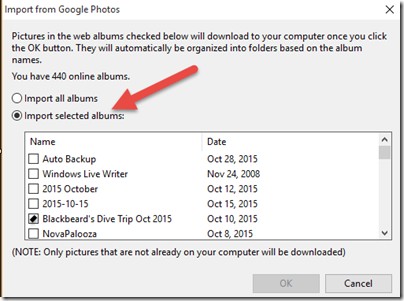 What about using Google Photos Backup? If you have installed Google Photos Backup and have it set to automatically backup the pictures in your My Pictures folder, it will be uploading the pictures it finds on disk – the originals without any edits. Therefore, if you want to upload the edited versions, you need to turn off Google Photos Backup until after you’ve made your edits and saved them. Then you can either turn the Auto Backup back on, or manually upload pictures to Google Photos. 2/12/16 NEWS! Google is retiring Picasa. March 15, 2016 the Picasa Desktop Software will be discontinued (if you already have it, you will see no change.) May 1, 2016 Picasa Web Albums will go away (all photos and videos in Picasa Web Albums are already accessible by Google Photos.) Read the official announcement here. 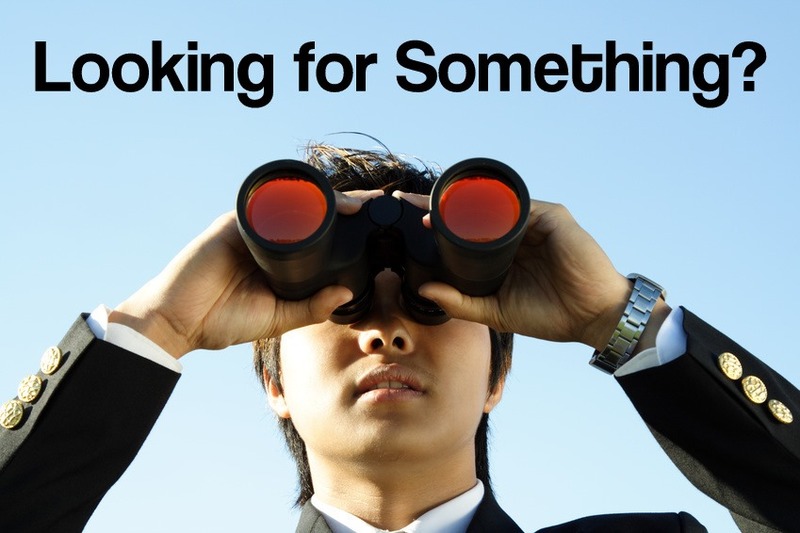 Keep a watch on this site – we will write more later in the week when the dust has settled. It’s been a weird year for Picasa. Google owns Picasa and Google is constantly changing stuff, yet the Picasa software had basically no changes at all. This is both good news and bad news. It’s good because it signals that Picasa is a mature software program. It is stable, the things you learned how to do last year still work the same this year. That is SO welcomed! It’s bad because it means that Google is directing its energies elsewhere and people fear that Google may be abandoning Picasa altogether. 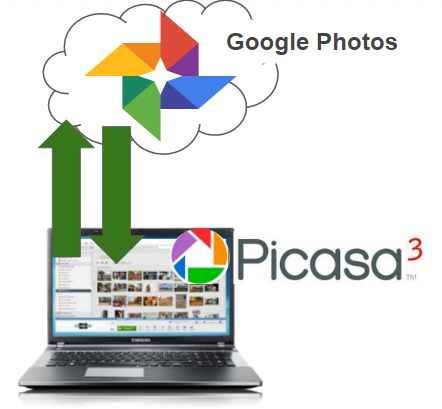 We are currently on Picasa version 3.9 and that was first released 5 years ago! 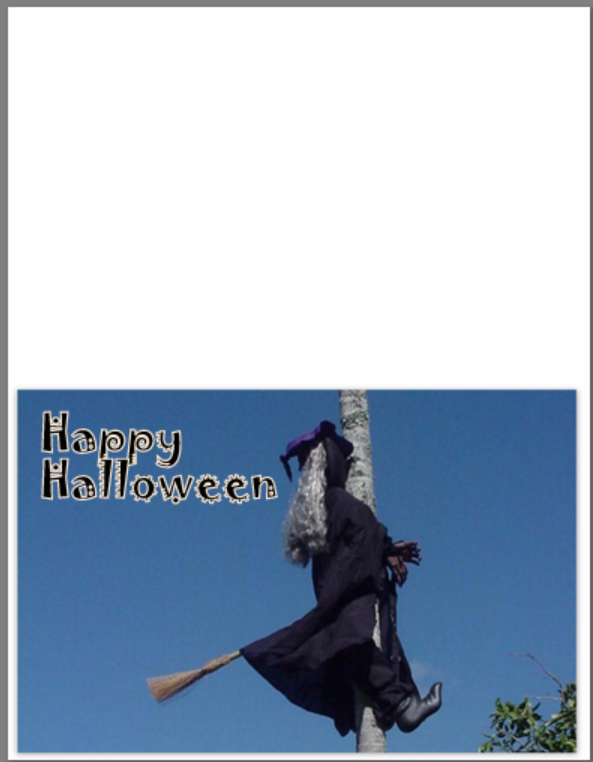 We did get one minor Picasa update in September where they changed the words on the Share Button. 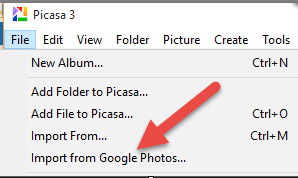 This change made me very happy because it tells me that Google has not forgotten about Picasa and they consider it part of their photo toolbox along with Google Photos. However, other than the words on the buttons, nothing else has really changed. When you upload a picture to Google Photos using Picasa, it resizes your photo with its old size limit of 2048 pixels per side, that’s about 4 MegaPixels. If you use the newer Google Photos backup, or upload directly from your smartphone, you can now upload High Resolution files – up to 16MegaPixels. 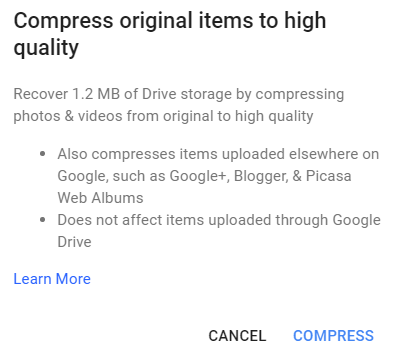 Note: There is now a workaround for Picasa’s size limitation by uploading at Original size, then later using the Google Photos command to “Recover Storage” and it will resize all original photos online to the free 16Mp. But, my point is, they haven’t updated the Picasa software to the new standards. 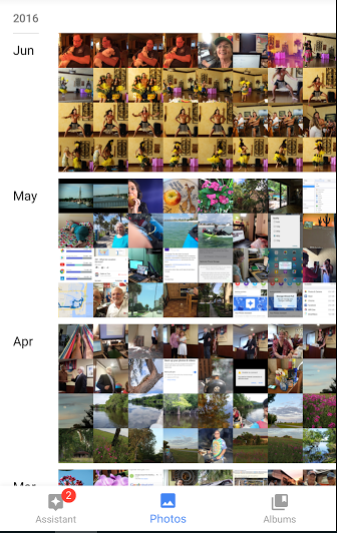 Google Photos was announced at the end of May. It is a brand new product for Google, built from scratch to be useful in a world where pictures are being taken by phones and viewed on a tablet. Google envisions a world where computers don’t exist anymore. For most of us this is still a ways in the future. In my experience the future keeps arriving faster and faster, so I have embraced Google Photos and am having great fun with its new features. See our web show on Sunday, Jan 3 where our beginner’s lesson will be on How To Make Movies with Google Photos. I still like having pictures on my computer and I still like using Picasa to work with them. I think Google understands this and has no intention of taking Picasa away from us, but it is way down on their todo list to work on any improvements for it. 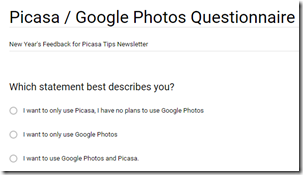 I’ve been writing a Picasa “Tip of the Week” for this blog regularly since 2008, and, for many years it actually was a weekly article. You may have noticed I’ve slowed down lately. 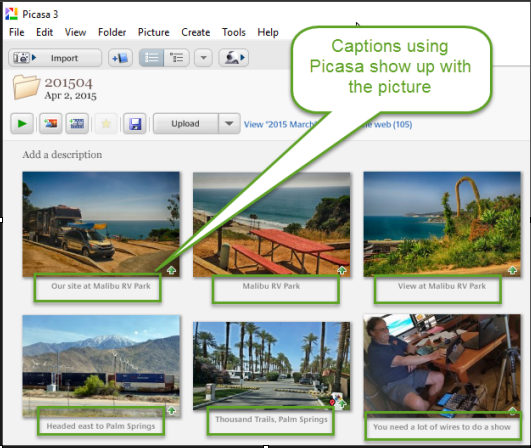 With over 250 articles written already I’m running low on new things to say about Picasa. We recently changed the header of this website to include Google Photos in addition to Picasa. 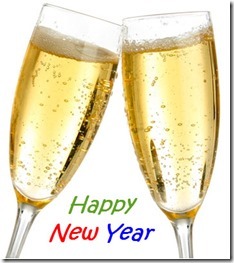 This blog was viewed about 580,000 times in 2015 by people in 219 countries! The busiest day of the year was August 29th with 8,988 views. 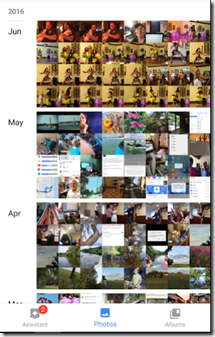 The most popular post that day was Google Photos Announcement–This is BIG. I am still struggling to decide how best to use Google Photos on my smartphone and web, and still get my pictures on my computer and use Picasa. I like browsing pictures on my computer with Picasa, and there are still many things that only Picasa can do – like captions, text on photos, watermarks, collages etc. But Google Photos makes it so easy to bypass the computer that I find myself using Google Photos for everything and never getting the pictures on my computer at all. I’ve experimented with a couple different methods – these will be topics for future articles. I’d really like to know what you all are doing with your pictures. 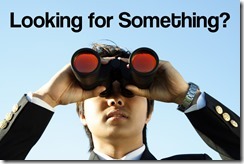 Answering just 3 questions will help me put together newsletters that are worthwhile in the year to come. Click Here to complete 3 questions.